The first Christmas with your baby is guaranteed to be a special one. Regardless of whether you gave birth early in the year or if you’ve just had your little one right before the big day arrives, the first Christmas Day you spend together is magical. It also gives you the opportunity to start your own Christmas traditions that you and your child will treasure for many years to come. If you’re looking for ideas on starting your own traditions or you’re simply looking to make this Christmas even more magical, below you’ll discover some great tips to inspire you. Sure, some people might claim they’re cheesy but family Christmas cards are a fantastic tradition and it gives you a great excuse to show off the new addition to your family. They’re easy to create yourself, or you can have them created professionally at an affordable cost. This is one tradition you can take part in year after year. So, what does it consist of? The most basic family Christmas cards include a picture of the family on the front. You can choose to add a photo of just your baby, but if you want to make it extra-special, add a picture of you and your child. That way, each year you can update the photo and keep a copy of the cards. Then in years to come you can enjoy looking back on how much your little one has grown. These will be a wonderful thing to give to your child later on in life too. They’ll have a picture of you all together every year – that’s actually a pretty rare thing these day’s as the majority of photos tend to be digital and kept online. You’re probably already planning on buying a cute Christmas themed outfit for your little one. So why not make it a yearly tradition? Buy yourself and your little one a new pair of Christmas pajamas. Not only will these look super-cute, but it really adds to the magical feel of the day. This tradition can be carried on for the rest of your life. Pajamas are always needed during the cold winter season and as your children age, they’ll really start to appreciate getting new comfortable pajamas on Christmas Day. Now this isn’t so much an annual tradition, but it is a great way to make baby’s first Christmas extra special. Baubles are a particularly popular baby’s first Christmas item you can invest in. If you get a personalized bauble with the date included, you can still hang it on the tree each year to remember this magical first Christmas together. Alternatively, you can get a hand and footprint gift which can capture just how tiny your little one was during this first Christmas. You could even turn that into a tradition by taking foot and handprint samples each year and comparing them in size to the years before. Stocking are cute and can be brought out each year. As your baby grows, they’ll start getting excited at Christmas to hang their stocking and wait for Santa to fill it up. Before buying one, think about the type of things you’re most likely to put in them. Will it be used for trinkets or do you plan on filling it with a mixture of different sized items? Think about the space requirements you’ll likely need as your child grows. When your child grows up, they’ll really appreciate having the stocking they’ve had since birth. It’s a beautiful tradition and something that will really be treasured in the future. While you baby is too young to understand and appreciate most of the Christmas spirit, they will definitely appreciate twinkling lights! So, if you want to make it extra special for your little bundle of joy, go overboard with the lights and watch their little faces literally light up! Worried about the cost? Remember, your baby isn’t going to appreciate a sack full of gifts this year. In fact, they’re most likely going to be more impressed with the wrapping paper than they are the gifts. They’re also likely to be spoilt by friends and family. So, use the money you’ll save on buying lots of presents and invest it in the lights instead! Of course, traditions don’t just have to be saved for Christmas Day, why not start by creating your own family Christmas Eve tradition? It could be a personalized Christmas Eve box. These tend to go down really well with older children so it’s something you can do each year. Inside the box, place little treats and activities to help get you all in the Christmas spirit. For baby’s first Christmas you can add things such as their Christmas pajamas, a soft toy, a rattle and new clothing. Obviously they aren’t old enough to appreciate the excitement, but you could use it to store mementos of their first Christmas. They may not be out of diapers yet, but now is actually a great time to think about investing in something your child can give to their children one day. A heirloom holds great sentimental meaning and can be used again and again. It could be a snow globe, a fancy silver personalized spoon or a keepsake box. Something that can be passed down to future generations is the best tradition you can start at Christmas with your little one. These are just some of the great ways you can make baby’s first Christmas more magical. While they may not stay little forever, the traditions you begin now could carry on even after you’re gone. 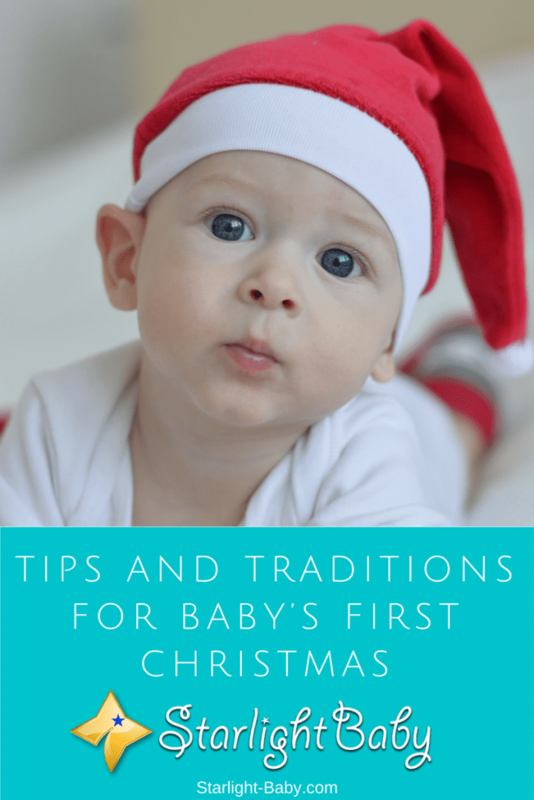 Why not think of your own way to make baby’s first Christmas special? Creating your own unique tradition will mean so much more. How do you plan to spend your baby’s first Christmas? Let us know below! Well, i have to say that your points are laid out carefully well on how to make a child’s first christmas a memorable event. Christmas is one of the most important period of celebration in the word, so as having your first child as a parent. Bringing these two important things in ones life can be a little challenging but with most of your tips explained on the post, am sure it can be handled well. Good article by the way. Christmas celebrations are so fun and memorable that most people don’t want it to end, especially the civil servants. It’s a time they get to spend quality time with family and friends without having to worry about work. Now with a little comes a whole different kind of preparation on how to spend the Christmas event, but in all starting up preparing on time is the key to meeting up and not be left frustrated with things you couldn’t. Nice tips by the way on how to spend one’s Christmas with one’s new baby for the first time.